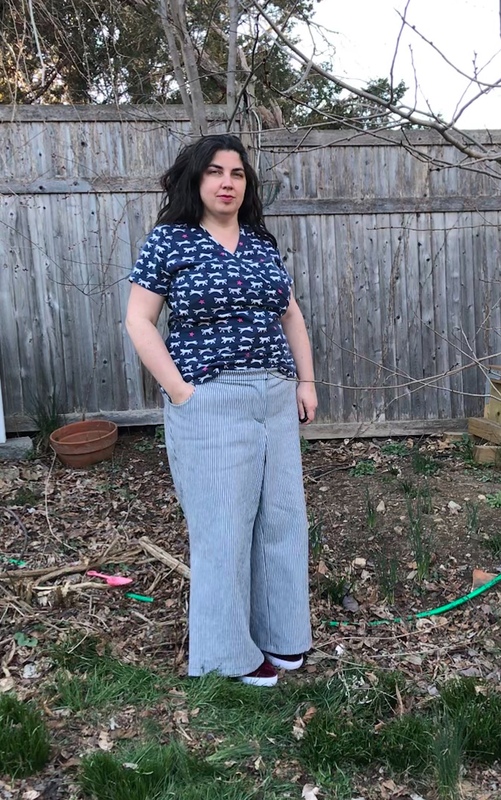 Have you seen lots of wide leg pants on Instagram and sewing blogs? Wide legs are back in style, and Peppermint Magazine has a free Wide Leg Pants pattern that both Megan and Maggie wanted to try even though we were both new to the wide leg pants trend. We ended up with two very different versions, so hopefully we can inspire you to try out wide leg pants, no matter what your typical style is! This is a FREE pattern that goes up to 49″/119cm waist and 54.5″/139cm hip and is designed for medium to heavy weight woven fabrics. My measurements are 45/40/47. I’m 5’3” tall. I’m an apple from the side, hourglass from the front. I sewed a size G graded to an H waist.